Although the racing culture really isn't my thing, going out for J World's Thursday Night Races is a free way to get practice on a simpler, smaller boat than my own. Racers are also very focused on completing maneuvers quickly and trimming sails efficiently, so it doesn't hurt to have exposure to that even if my cruising will be a far more relaxed approach. I had been told the slots can fill quickly and to be sure to call between 8:00AM and 8:30AM to secure a spot. There were five of us aboard for last night's races. The helmsman from J World has been racing since he was 10 and is clearly very steeped in that world. The crew had varying levels of experience. I told the helmsman I am a total newbie so he could assign me an appropriate position. I'm glad I did, and glad I wasn't merely regulated to rail meat. However, I think I too often underestimate my skill level and overestimate that of others, when the marginal difference in skill level is likely not as large as I tend to assume. The helmsman discussed tactics and sail trim throughout the race, so it was like a mini-lesson if one paid attention. The helmsman also gave a clear explanation in advance of what we would be doing and who needed to be where at each major maneuver. That was definitely helpful since we had five people aboard who had never met and with varying levels of experience. I was assigned to the mast. When we rounded the first mark my job was to be ready to hoist the spinnaker as quickly as possible. I was glad I had brought along some old racing gloves gifted to me by Phil from s/v High Life! When we rounded the next mark, it was my job to help the spinnaker trimmer pull in the spinnaker quickly as we switched back to the jib. Obviously it was a relatively simple job, but I'm glad I have very good sea legs because I spent most of my time far from the safer confines of the cockpit. I stood on the cabin top, leaned back into the shrouds for leverage, and hoisted as fast as I could; any failure in my balance and I'd quickly be overboard as we were making a sharp turn around the mark. I then generally stayed forward of the cockpit, either beside the mast or on the side deck, with little to hold onto and hopping back and forth with each tack or gybe to help distribute weight efficiently. At times I could easily have been rolled right under the lifelines and into the drink. I wore a life vest most of the time, but it was so bulky I would probably have felt safer without it to have the increased agility. A fancy Spinlock Deckvest with a safety harness to hook into jack lines is on my wishlist, but at about $360 I just have to spend the money elsewhere for now. I'm getting a simple PFD for the time being so I will have one handy for dinghy hops and such. 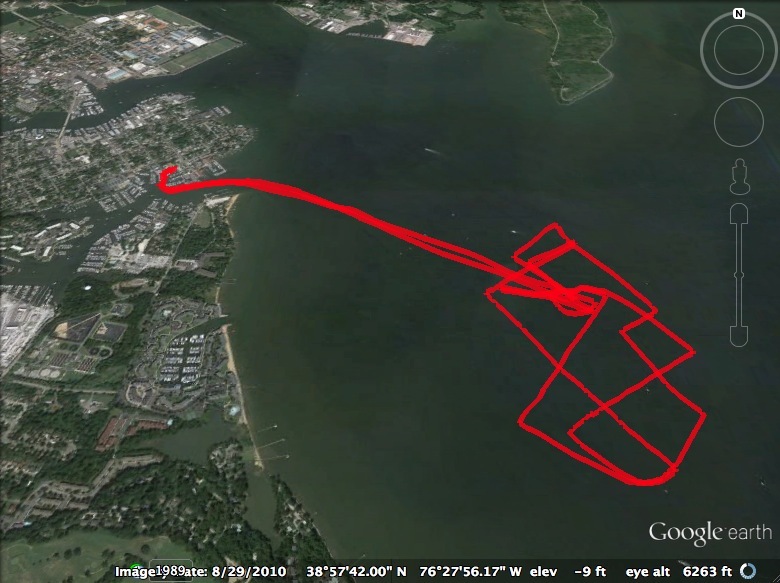 I was disappointed that I had forgotten to use my new Navionics app to track my course during my lesson on Tuesday, so I made sure to turn it on and then stow my bag below before we shoved off. 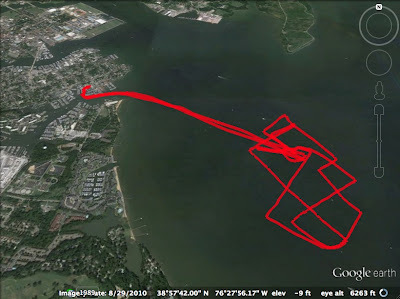 Below is our track from the two races last night, imported into Google Earth. I'm pleased with the Navionics so far and will enjoy using the chart plotter as I dinghy around. Next little project to tackle: inflating and patching my inflatable dinghy. I should be getting an outboard next week so I want to get the dink ready to go... which also means I've got all the registration paperwork to take care of with the Department of Natural Resources. At least they are helpful and efficient; definitely better than a trip to motor vehicles.